As coatings are becoming increasingly complex the need to characterize not only the outer surface but the multiple-layers beneath the surface has become increasingly important. Utilizing depth profiling techniques, multi-layer systems can be characterized from the outer nm through to 40 microns giving quantified information with depth. As part of a routine quality control testing schedule to ensure the coatings are being deposited correctly. Monitoring patient condition via blood diagnostic sensors has major importance for improving healthcare especially for intensive care patients including premature babies. The critical performance parameter of these devices is the wettability of blood over the catalytic / enzyme activator surface with greater blood contact resulting in better sensitivity and reproducibility. To disperse blood efficiently, conventional sensor design generally uses a coated woven polymer mesh to overlay the active layer. However the mesh surface is susceptible to contamination and coating failure leading to errors in readings. New coating systems have been evaluated by Lucideon using plasma pre-treatment followed by coating with a fluoro-carbon terminated poly(butylene oxide-sulphonamide). Imaging SIMS has been used to determine the coating character and coverage in an informative imaging presentation. 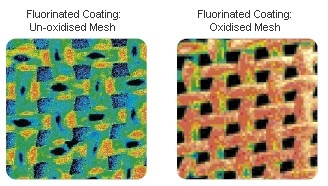 Imaging SIMS provides a direct indication of the uptake level and coating uniformity on the different meshes. Plasma oxidation is likely to result in stronger ionic bonding between polymer and coating resulting in greater durability against abrasion. As a quantitative method, XPS is a valuable tool for the determination of coating uniformity and thickness. This is demonstrated for a functional siloxane coating on a polymer substrate where multi-area XPS analysis (supported by SIMS imaging) showed a reasonably homogeneous siloxane distribution over the polymer surface.